The T-Max might be small, but that doesn’t stop it from boasting almost every feature you’d find on a motorcycle. This scooter comes with a 499cc engine, a sporty chassis, and decent off-the-line punch. The wind protection features, in particular, are noteworthy. The Kymco 700i MyRoad also ranks among the scooters that resemble motorbikes. With a 699cc engine, this scooter also features keyless ignition, an electronically adjustable suspension, as well as ABS. With it, you should be able to get to top speeds of more than 110 mph too. The Suzuki Burgman 650 comes with a 638cc engine, ABS, and push-button transmission. Ranked among the leading scooters that look like motorcycles, this option works well and safely even though the 755mm seat height is somewhat lower than you’d get on a motorbike. The Gilera GP800 has an 839cc engine. The monster also can get to 75bhp easily enough on account of the v-twin engine it boasts. Although it is quite big and somewhat looks like a motorbike, at 248kg this scooter is quite light. Still, the fact that it can get to 120mph is saying a lot about it. Boasting a 582cc engine, the Honda Silverwing might look more like a motorcycle than a scooter, but it isn’t the biggest of all the scooters on the market today. As the flagship maxi-scooter under the Honda Brand, it comes with the build quality you’d expect from most of the scooters that look like motorbikes. That said, the Honda Silverwing isn’t quite as lightweight as most people assume. In fact, it tips the scales with its 247kg. Still, it does feature ABS, which makes braking safe. Other accessories you can expect include heated grips, pillion armrests, as well as a 45L top box. For starters, you will have an easier time learning how to ride a scooter than you would a motorcycle. Even for those scooters that look like motorcycles, the learning curve is pretty smooth. Most of the engines on scooters are less powerful and much smaller than those on bikes. The standard engine size on a scooter ranges from 50 to 150cc. However, the smallest motorbike engine will usually start at 250cc. That said, some of the scooters that look like motorcycles do have 250cc engines. Still, this does not mean that you can use them to get the same speed and acceleration capabilities offered by motorcycles. Another difference between the two revolves around the tires and wheelbase. This means that it is safer to ride a bike at high speeds than it is on a scooter. Scooters, on the other hand, can handle slow speeds better because of the distance between the wheels as well as the tire sizes. Scooters engines are placed right in front of the rear wheel. This creates a sizable space over the wheel where the rider can store cargo and helmets. Motorcycles, on the other hand, lack this inbuilt storage space (except for large touring bikes). As such, riders have to attach hard or soft-sided saddle bags for storage. With a scooter, you will be able to reduce the total time you spend on the commute – especially if the distance you are traveling is relatively short. Irrespective of your location or the rush hours you encounter, traveling in a scooter means that you can skirt your way through traffic and arrive at your destination faster. Scooters trump both motorcycles and cars where costs are concerned. With a scooter, to this end, you should be able to save an average of several hundred dollars per year. These savings come from paying affordable insurance per month while having to deal with fewer costs where gas expenses are concerned. Scooters that look like motorcycles, as well as those that are just as small as you’d expect from a scooter, tend to be versatile. This means that you should be able to use your anywhere. To this end, you can as easily ride your scooter in the countryside as you would in an urban environment. In both cases, the scooter will provide you with the fast and convenient mobility you are looking for. Unlike 4-wheeled vehicles or their motorcycle counterparts, scooters are relatively affordable to buy. As such, most people can afford them – which is one of the reasons why the demand for scooters is shooting up. Another benefit that you get by switching to a scooter is that they are good for the environment. Some scooter brands are specifically designed to cut on costs both in terms of finances and for the environment. Although this might not seem to be the case, scooters are pretty comfortable. Most of them are light, meaning that you should be able to store and carry them easily. Further, a couple of the varieties also come with adjustable seats, which you can alter to maximize your comfort. Last but not least, almost every scooter you will get will have shock absorbers, a feature that will maximize the effects of accelerating and breaking. Especially among the scooters that look like motorcycles, you will find that most look quite stylish and posh. Famous brands including Super Turbo, X-Treme, Fuzion, and Razor, all feature superior designs and top-notch quality. 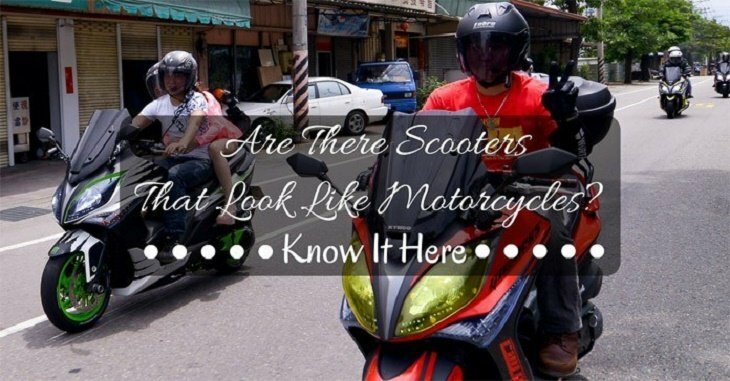 Over and above everything else, understanding the main differences between scooters and bikes will enable you to differentiate between scooters that look like motorcycles and actual motorcycles. Use this guide to help you make these distinct differences then next time you are shopping.